High Peaks Pure Earth has translated a blogpost by Woeser written in May 2015 for the Mandarin service of Radio Free Asia and published on her blog on May 26, 2015. The blogpost was written after the devastating 7.8 magnitude earthquake that shook Nepal on April 25, 2015. This leads Woeser to reflect on the precarious situation that Tibetans find themselves in in Nepal and also to write about China’s strong influence in the area. The earthquake that hit Nepal with brutal force and the subsequent human and cultural disaster left me in deep sadness, a feeling much worse than a shock. What I want to write about is my shattered dream of “going through the backdoor” of Nepal to make a pilgrimage to India without a passport ten years ago. Subsequently, a Taiwanese translation of Lonely Planet’s “Nepal” became the last bit of hope. 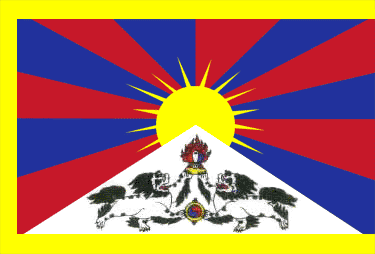 But in recent years, even this hope has become increasingly distant; fellow Tibetans who had previously gone to Nepal had their passports confiscated by the Chinese government; their dreams of being able to once again visit the sacred Buddhist places in one of the neighbouring countries have become mere reverie. On April 27, the BBC reported that the majority of Tibetans affected by the earthquake in Nepal were “illegal residents”, living quiet lives in the outskirts of Kathmandu, in mountain villages near the Tibetan border. 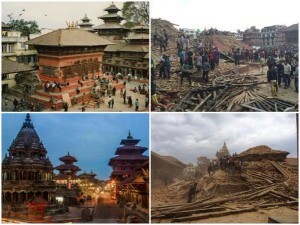 These places were all hit by the earthquake, some were even completely razed to the ground. 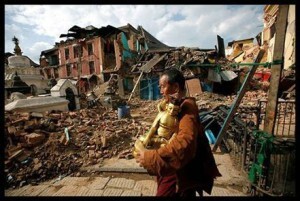 The report stated that the Nepalese government, worried about provoking the Chinese government, refused to make public the exact number of Tibetan casualties; so the ethnic group hit hardest by this shocking earthquake remains “invisible” and the actual number of deaths may forever remain a mystery. Human Rights Watch issued a report in April titled “Under China’s Shadow: Mistreatment of Tibetans in Nepal”, pointing out that for Tibetans fleeing from oppression in China, Nepal has always been an important refuge and hub. In recent years, the Chinese government has increasingly pressured Nepal, forcing the authorities to strictly control the over 20,000 Tibetan refugees. Nepalese police forces have begun to arbitrarily detain people, use excessive violence, monitor and surveil Tibetan communities, and to even forcefully intercept and return Tibetan refugees trying to cross the border. My mother’s cousin has not been back to Lhasa for two years, even though she is old and weak and without relatives at her side, she still decided to live in Kathmandu and fulfill her religious obligations. The actual reason is that she feared that once she returned to Lhasa, her passport would be confiscated and she would never have the chance to leave the country for a pilgrimage, but would have to remain in an alien land for the rest of her life. The good news is that she remained safe during the earthquake, but she certainly got a shock. And isn’t this kind of shock even more intolerable? Back then, when I was researching Tibet during the Cultural Revolution, she said in a traumatised voice: “If only I could get to Nepal, I would no longer be afraid, I would finally be able to sleep well at night; but as long as I am in Dram, every time I see the five-starred red flag, I am so frightened…” I remember back then, she found a Tibetan with a Nepalese ID in Kathmandu who was willing to act as my false relative and wrote an invitation letter for me to leave China under the pretext of visiting relatives. This is one of the very few ways in which Tibetans can hope to obtain a passport; it has become quite popular. But my luck was not good; me and passports have not found ourselves together yet. Perhaps for good reasons, because it prevented me from being affected by the devastating earthquake. This incredible forceful earthquake has already calmed down. On Facebook, Twitter, and WeChat, many Tibetans inside and outside of Tibet have been posting photos of Tibetan monks in their maroon-red robes, carrying out disaster relief work, transfusing blood, rescuing survivors from the ruins, or providing victims with food. They are the most active group among all Tibetan refugees in Nepal. 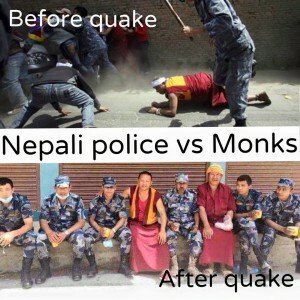 Because they had participated in anti-Chinese protests prior to the earthquake, they had been chased and badly beaten by Nepalese police forces. But witnessing their selfless behaviour in this calamity deeply moved Nepalese police; they sat with them side by side, even hugging each other as if they were brothers.